If the refereeing is as bad as the last time the Axemen were at the AUC it won't be pretty; these teams really don't like each other. X takes SMU in 3 (they've had their number all year. UNB in 5 over X needing home ice to win the series. Unfortunately, I have to put my money on SMU as well. They are a playoff team and UNB is not. It hurts to say that as I live and die UNB hockey. But I don't see it going any other way. 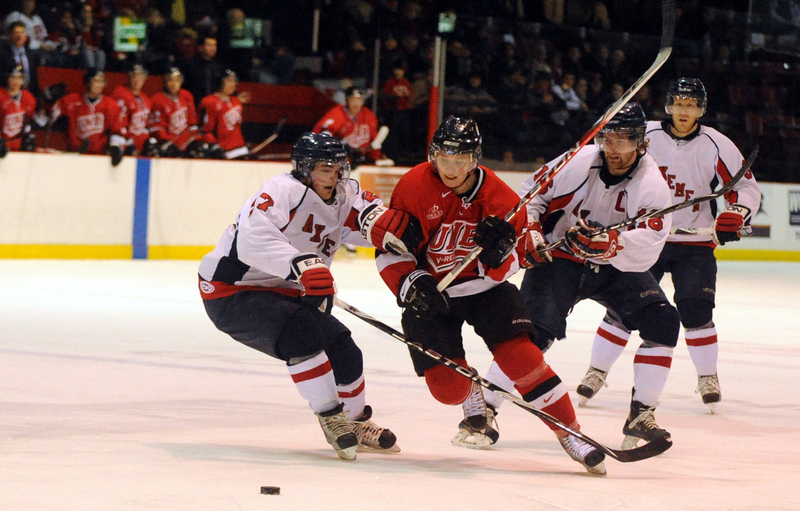 UNB will come out of Acadia series bumped-and-bruised no doubt. Acadia doesn't have the wheels so will do whatever they can get away with to slow pace down. Series will go as far as refs let the play go. SMU will score their way to victory in the other series. Who cares about the finals - all about staying healthy in my opinion. I assume the format is 2-2-1 and not 1-1-1-1-1? I can see UNB taking two at home, and getting pretty banged up depending on how the officials call the game. I can see Acadia rebounding at their home, taking advantage of the last line change to match lines against UNB and perhaps grinding out a win. I don't see them doing it twice. It probably won't be the most "entertaining" hockey, but playoff hockey. Acadia is a defence-first team, and they should be doing their best to try to take away the centre of the ice and force UNB to the boards. I also believe, like many, that the Axemen will take every liberty they can to try to get UNB off their game, and the V-Reds will probably respond in kind. I would love to see the two teams go end to end, which plays to UNB's strengths, but I will be shocked if it happens in this series.